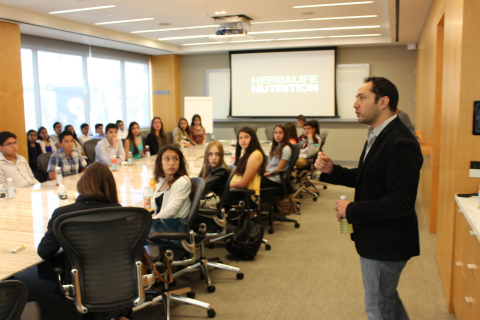 LOS ANGELES--(BUSINESS WIRE)--Herbalife Ltd. (NYSE:HLF), a global nutrition company, welcomed 45 high school students from Prepa Tecnológico de Monterrey’s Chihuahua Campus to its Los Angeles offices on Friday, May 1 for a roundtable discussion about the company, its business model, operations and products. This marks the second year of the partnership, which the educational institution’s faculty and staff initiated in 2014. During the two-hour casual roundtable discussion, Herbalife executives shared information with the students regarding the company’s manufacturing facilities, quality control initiatives and global marketing activities, which include sports sponsorships around the world, such as soccer teams the Los Angeles Galaxy in the U.S. and Pumas in Mexico. “What really interested me was the company’s mission and vision, and how they started selling the product. I also liked the fact that they support their employees and they help people lead healthier lives,” stated seventeen-year-old student Diana Mendez. The session also included an open Q&A, where students had an opportunity to ask executives particular questions regarding items not covered during the formal presentations. “Visiting Herbalife is very important to me, because in our curriculum we study strategic planning, and explore what it’s like to manage a corporation, whether small, big or multinational, like Herbalife. As a program director, this access to senior executives gives our students the opportunity to visualize themselves as corporate leaders, and gain knowledge about how to manage a business of this magnitude,” stated Sofia Reyes Beltran, director, business innovation and management, Prepa Tecnológico de Monterrey, Chihuahua Campus. The informal partnership between Prepa Tecnológico de Monterrey in Chihuahua and Herbalife was initiated by the institution’s faculty as a result of the company’s significant presence in Mexico. “At Herbalife we are delighted to share our company’s mission and history, as well as discuss the many advantages of our channel to market with these young students. It is always a pleasure to welcome them for a healthy breakfast, and we look forward to many more years of this annual tradition,” concluded Ibi Fleming, senior vice president and managing director, Herbalife North America. We support the Herbalife Family Foundation (HFF) and its Casa Herbalife programs to help bring good nutrition to children in need. We also sponsor more than 190 world-class athletes, teams and events around the globe, including soccer player Cristiano Ronaldo, US soccer team the LA Galaxy and champions in many other sports.